Christina Vinios and Folkestone topped the FEI Intermediaire I CDI*** at Dressage At Devon. After they battled the rain and bested the FEI Prix St. Georges yesterday with a score of 68.90, Christina Vinios and Folkestone were the only pair to break 70 percent in the FEI Intermediaire I CDI*** at Dressage At Devon (Pa.). Their score of 71.26 percent earned them the win. Vinios imported the now 9-year-old Oldenburg gelding (Fidertanz – El Kattulika, Rubenstein) from the Germany as a 4-year-old and enjoyed a successful season in the small tour with him this year. 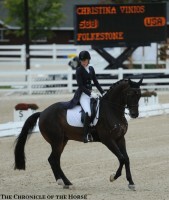 Jane Karol’s second ride in the class, Sunshine Tour, took second place with a score of 69.00 percent. Katie Riley and Toy Story rounded out the ranks in third with a score of 67.81 percent.